This is the perfect healthy breakfast! It makes 12 so eat two and stick the the rest in the fridge for the rest of the week! Onions, mushrooms, red peppers, green peppers, mushrooms, spinach, ham, or bacon. These omelets have mushrooms, red peppers, and spinach. 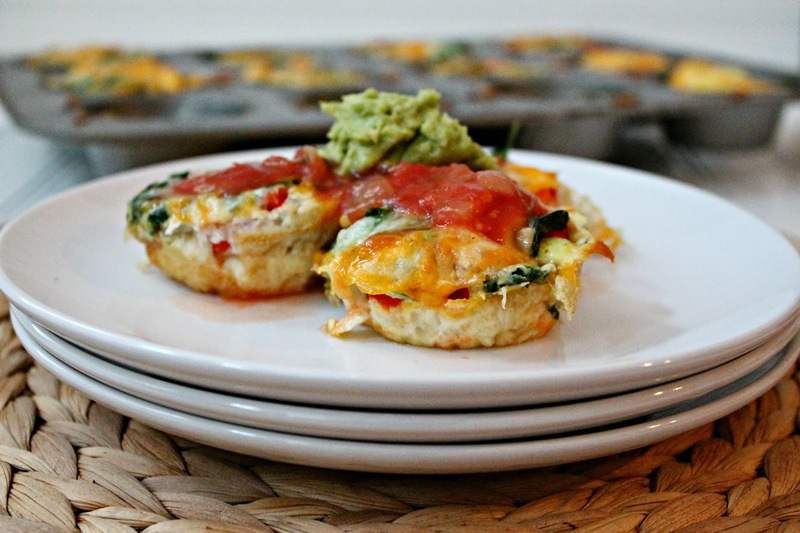 Spray the muffin tin with non-stick cooking spray, then crack 2 egg whites into each muffin tin hole. Add about 2 tablespoons of the veggies/toppings you like into each tin. Crack an egg in the tin, mix around the egg whites. Add Salt and Pepper as needed. Sprinkle a little bit of cheese on top. Put into the oven and cook for 20 minutes or until the eggs are a little brown on top. Wait a few minutes then pop them out with a fork. 12 egg omelets are a lot for our little family so I froze some we had them for breakfast a few days later.